• 24x internal up to 4tB SATA/SAS w/8GB Fibre Channel Removable Drive Bay. Sixteen-core Opteron™ 64XCPUs with 10TB-100TB internal drive bay all in RACK or Tower available today. • Supports Real-time Compressing and Streaming with optional compressed codec to select format. The GVS9000 64X CPUs, GVS taken efficient data access one step further, to exceed data access over 16Gbit/sec ideal for most application such as Aerospace, Animate, Audio/Video 4K & HD editing, Biotechnology, Communications, Defense, Education, Manufacturing, Medical Imaging, Mobile equipment, Oil & Gas, Pharmaceutical, 2D/3D Stereoscopic, TV Station, and Visualization, every thing you need in 19" rack mount or tower unit with less than 4U space. The convolution integral mathematics is a function derived from two given functions by integration that expresses how the shape of one is modified by the other. 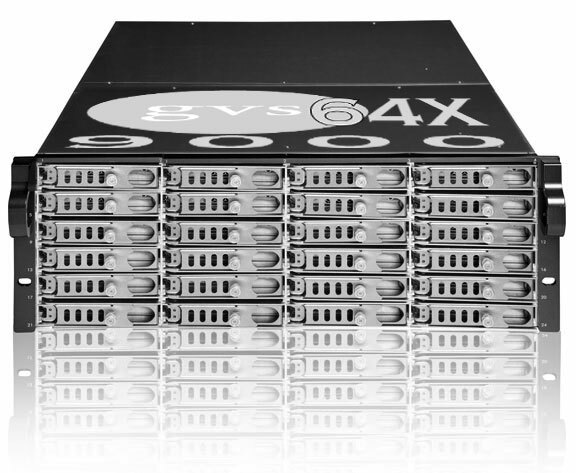 GVS9000 64X CPU System is the ideal product for large mathematical deconvolution applications with its ability to expand on its core, and extraordinary high speed graphics that provide the visualization in 2D/3D into the realistic world. In a deconvolution analysis the improvement of resolution of images or other data by a mathematical algorithm is designed to separate the information from artifacts that result from the method of collecting it. This process also utilizes a large number of mathematical calculations. In a color-grading setup, GVS9000 64X CPU provides an excellent, uncompressed, Dual Link HD recorder/player which is compatible with devices such as Pandora Pogle, allowing multiple uncompressed passes through the grader. It has been tested as a RS422 controlled player with DaVinci, Smoke, Lustre and Pogle system. For online storage, the GVS9000 64X CPU is designed to work with the latest Nomadic and other Shared storage product technologies. Connect via fibre channel or 10Gbit to the Nomadic 12xPro, Nomadic 4U or GVS9000 VTR certified storage media. A complete solution from ingest, storage, edit to film in a single format with a wide range of post-production workflow options. Tape transfers using real-time technology with rendering video effects to disk. - The GVS9000 64X CPU saves HOURS of transfer time per hour of material, allowing audio/video post to immediately start working against new cut, while video is being captured and rendered. GVS9000 64X CPU's 2.5GHz AMD® Opteron™ model, GVS has taken efficient data access one step further with RAM support for 256GB up to 1TB, internal storage of up to 10TB-100TB with optional 15,000 RPM and SSD with hot-swap drives at a speed of 128Gbit/sec. This solution is ideal for High Performance Computing (HPC) in scientific and technical environments, as well as for large screen walls. Each GVS9000 64X CPU's capable of controlling 42x LCD displays 1920x1200. This provides a high brightness, cost effective system with feature rich tools for other applications such as 3D Design, Film Coloration, Animation and Visualization. The Opteron™ processor’s super scalar, hyper traded architecture supports up to 4 processors in one GVS9000 64X CPU with a high-bandwidth execution core offering over discrete function, including quad floating-point units and Sixteen-core integer units, to process immense instructions in parallel — and of course, with 64-bit precision on 64-bit wide data paths 16 Way HyperTransport™. Optional server node with GVS CPU Render Software Render Tool. - GVS9000 64X CPU Capture Option your able perform very long captures without stopping, during which you can review, log or edit the incoming media.